Forget dry cleaning—you can clean a down comforter at home, for free, without losing any fluff. Here's how. 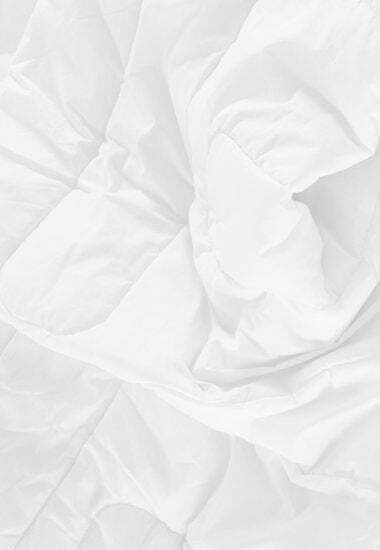 Just about every down comforter has a tag with care instructions that read, “Dry Clean Only.” But if you’re on a budget, or reluctant to expose your bedding to the harsh chemicals used in dry cleaning, or simply intent on avoiding yet another errand, there’s good news: You can clean a down comforter at home. It’s only possible, however, if you have a large-capacity front-loading washer. In a small machine, the considerable weight of a comforter can damage the appliance, while in a top-loader, the agitator can rip the fabric, causing feathers to spill out everywhere. But assuming that your washer is both large in size and front-loading in design, you can clean a down comforter by following these steps! First things first, load the comforter into the washing machine. Next, add in a mild soap or, better yet, a soap specially formulated for down—yes, such things exists! Avoid using standard laundry detergent. What you’d normally use to clean your clothing would, if used on a down comforter, strip away the natural oils that are responsible for making the feathers so exceptionally light and delightfully fluffy. Set the washer to run with warm water on a delicate cycle. If there’s an extra rinse option, enable it. If there isn’t, that’s OK; you’ll simply need to run the comforter through a separate rinse cycle manually. No matter how you achieve it, the extra rinse is needed to remove soap residue from the down. Immediately transfer the comforter to a high-capacity dryer. Set the dryer to operate on low heat, and toss in either dryer balls or clean white socks stuffed with tennis balls. Yet another option is to periodically remove the comforter from the dryer and give it a vigorous shake. All three methods perform the same important function, which is to prevent the down from clumping. As the comforter dries, be sure to check on it every now and again, particularly at the beginning of the cycle. There is a danger of the comforter overheating, in which case the fabric could either melt or get burned. If you notice the comforter sticking to the interior walls of the dryer, stop the machine, remove the bedding, and hand-fluff it before continuing. Keep the comforter in the dryer until it is bone-dry and the down has returned to being soft and fluffy. This may take several hours. Resist the temptation to take the comforter out of the dryer before it’s completely dry. Doing so would, at best, compromise the bedding’s insulating power and, at worst, encourage the growth of mold and mildew. Want an easier cleaning routine? Keep the bedding covered, at virtually all times, with a duvet cover. Like a pillowcase for your down comforter, a comparatively easy-to-clean duvet protects the underlying bedding from stains. Every three or four months, remove the comforter from its duvet and hang it outside by means of clothespins. Save this chore for a dry, sunny, and preferably windy day. Once it’s hung, leave the duvet out until the sun sets. Cared for in this way, a down comforter may only need to be cleaned once every five or ten years!